Tecnofluss is specialized in the manufacturing of capping lines and monoblocks for food, chemical, cosmetic and pharmaceutical industries. Capping monoblocks can be adapted to several cap formats. The frame is in AISI304, positioned on feet adjustable in height, made in high resistance material. 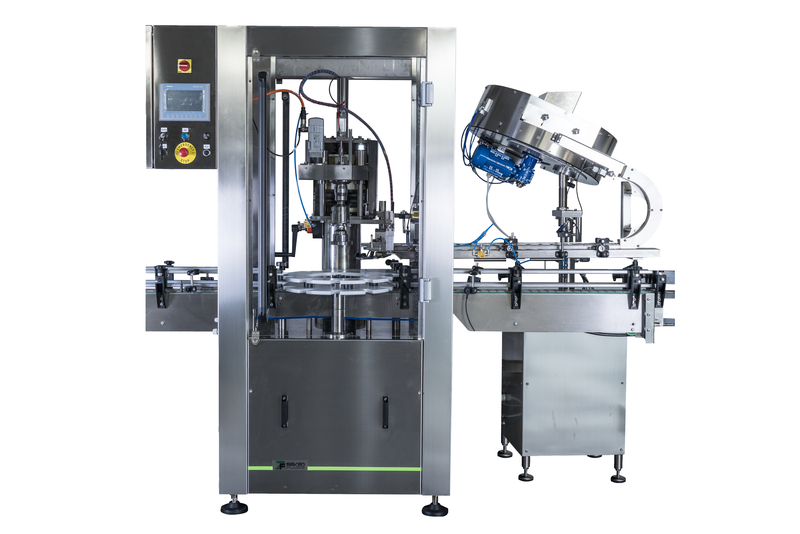 Safety protections are made in AISI304 and executed following UE regulations, integrated into machine frame. 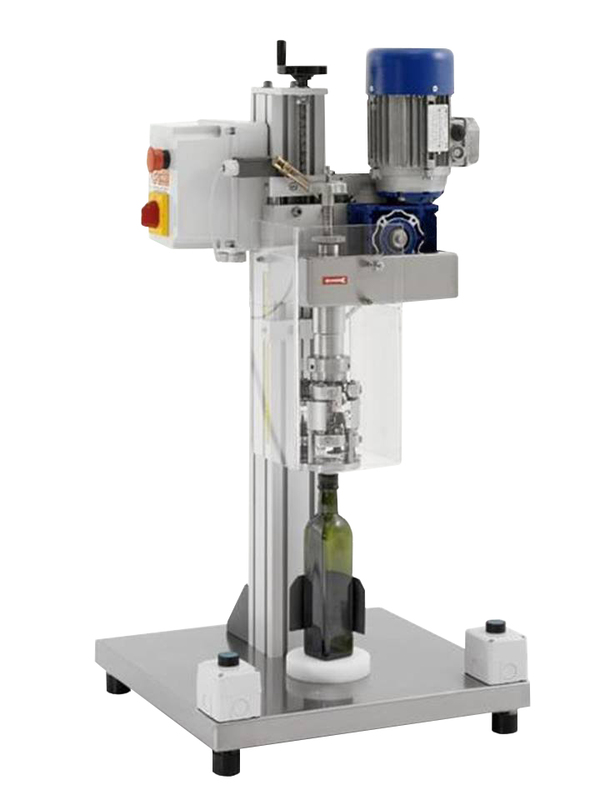 Caps feeding is made by a mechanical orientator, cap is placed onto the bottle by a pick&place device equipped with a mechanical gripper with pneumatic control for cap picking. Descent channel is completely made in stainless steel and equipped with missing cap detection. All the details meant to transfer and move the bottles are made in HD polyethylene that guarantees the minimum wear and the minimum noise. Once the cap is positioned, in the next station it is screwed by the magnetic friction head and adapter depending on the kind of cap, for ex. : a clamping ring is used for pilfer-proof caps, while a ribbed cap is handled by a special head etc.. The magnetic friction head allows a very good execution of the closing, since it can be adjusted through the specific notches. 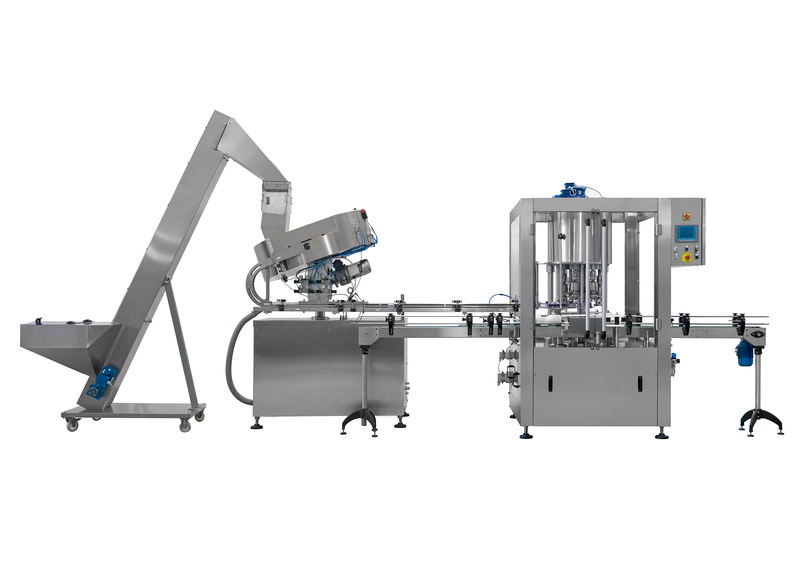 The next station is equipped for the control of cap presence with automatic rejection of the defective bottles, without machine stop. The electrical equipment is controlled by PLC with inverter on all the motors. Control panel includes a buttons set with operator panel or touch screen. 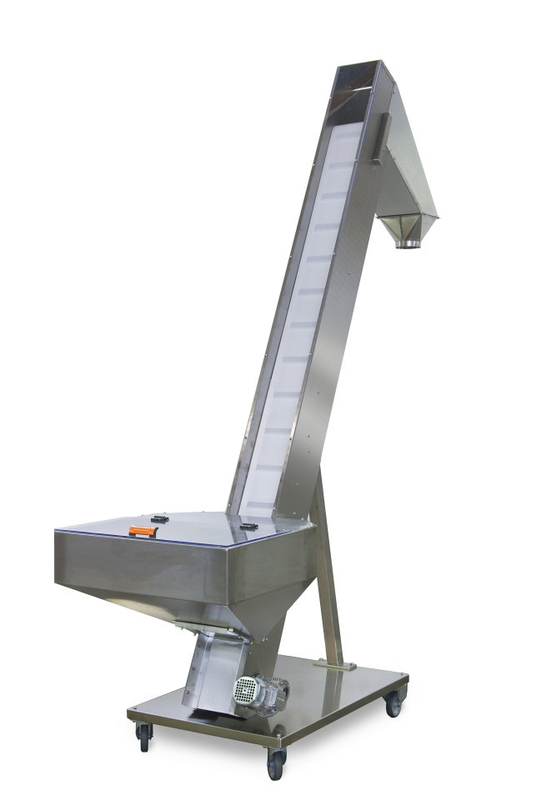 Caps Elevator for various caps dimension, suitable for feeding the mechanical orientators on the capping machines. 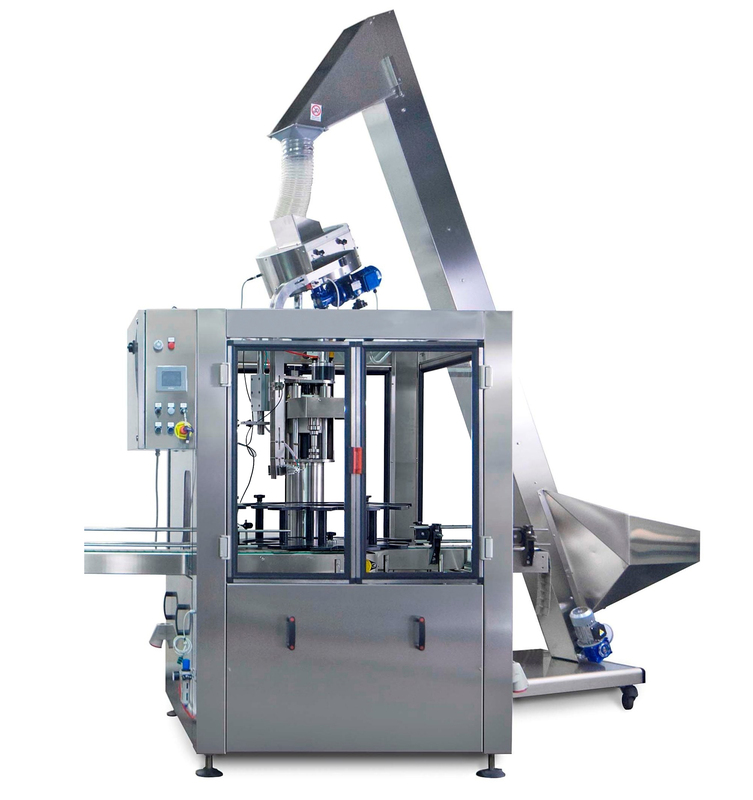 Rotary capping unit with continuous transport star with single feeder. Six capping heads for PE screw caps, suitable for food, chemical and cosmetic sectors. Equipped with elevator for caps loading. Production 6000 pieces per hour. 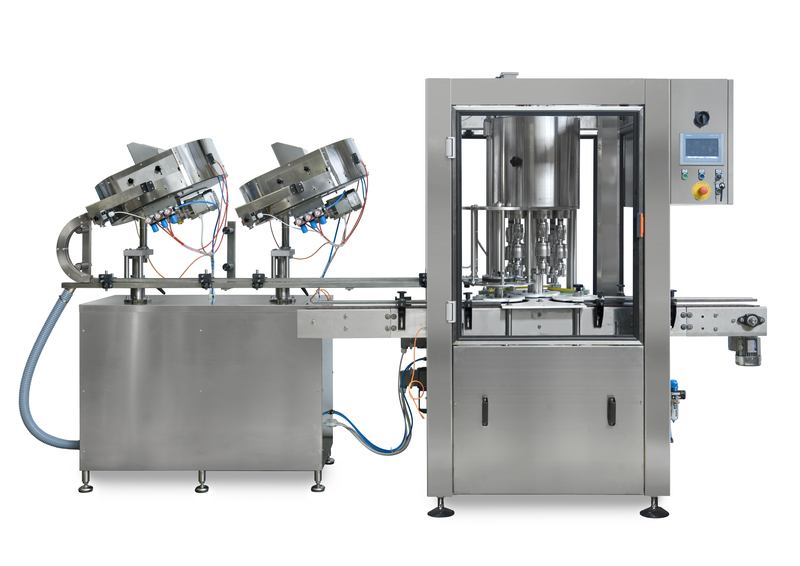 Rotary capping unit with continuous transport star with double feeder. Six capping heads for PE screw caps, suitable for food, chemical and cosmetic sectors. Production 6000 pieces per hour. Rotary capping unit with continuous transport star. Six capping heads for PE screw caps, suitable for food, chemical and cosmetic sectors. Production 6000 pieces per hour. Rotary capping unit with continuous transport star. Four capping heads for pilfer proof aluminium cap, suitable for food sector. Production 4500 pieces per hour. Rotary capping unit with continuous transport star. Four capping heads for pressure caps suitable for food, chemical and cosmetic sectors. Suitable for screwing twist off caps for glass jars, pilfer proof for aluminum caps such as oil bottles or syrups, threaded PE caps for cosmetics. Head in exchange for crimping pumps in the perfumery sector. Semi-automatic production by an operator. 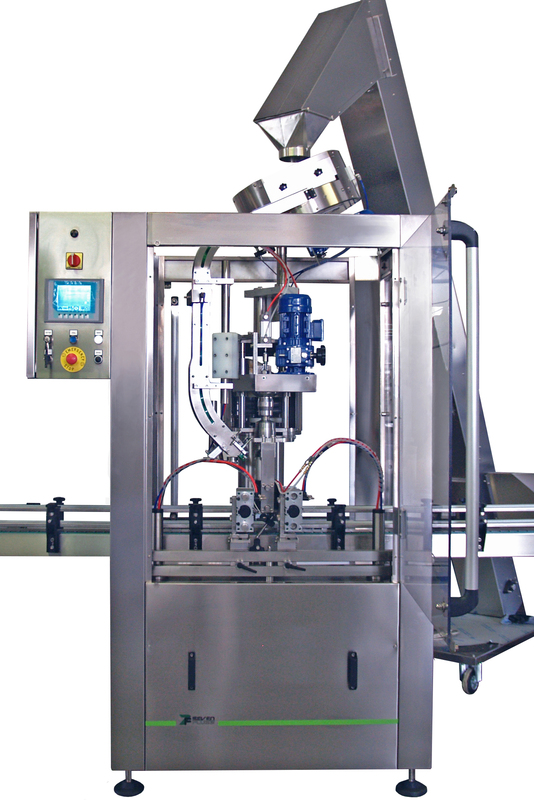 Star Capping Machine complete with a turret with cap orientation and pick and place for threaded PE caps. 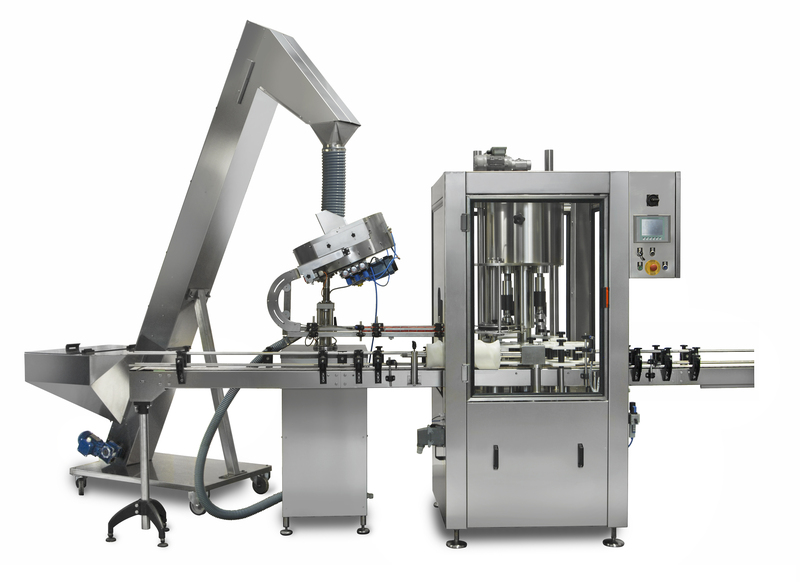 Star Capping Machine with a turret with cap orientation and pick and place for threaded PE caps. Suitable for capping containers and tanks. 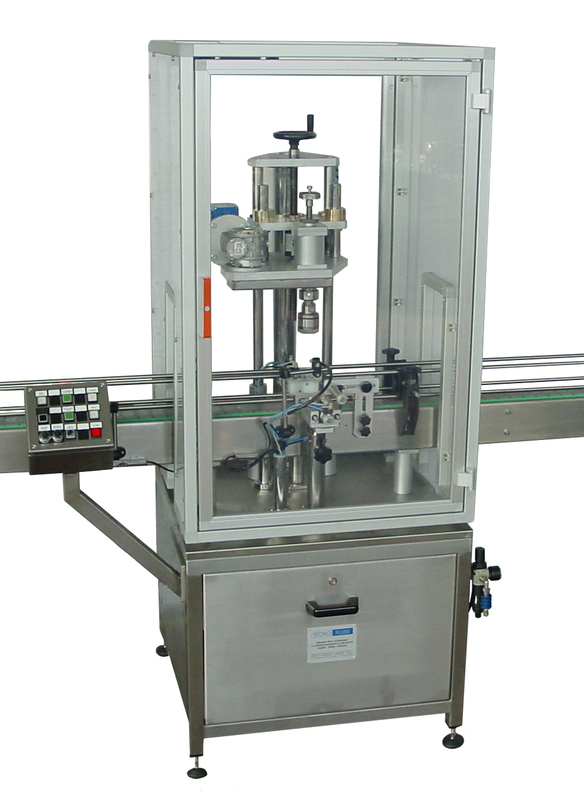 Linear Capping Machine with cap placing made by an operator. 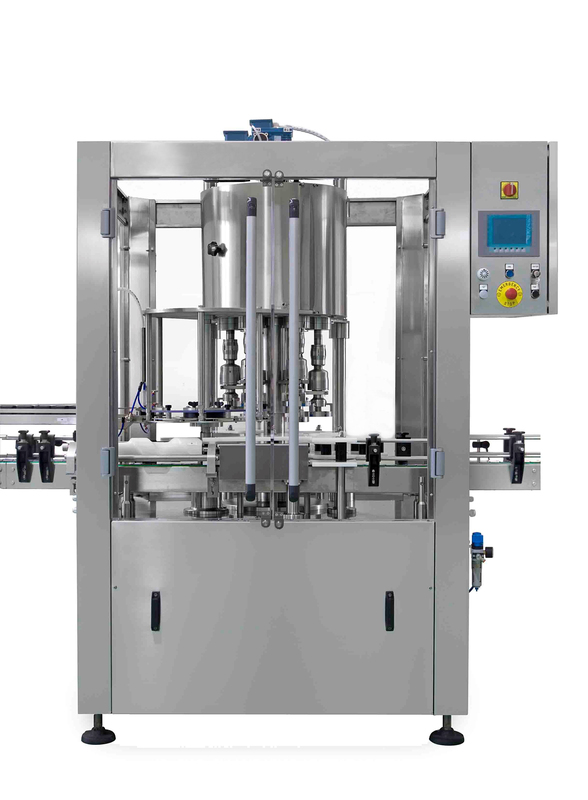 Linear Capping Machine complete of orientation tower and pick & place for the automatic capping cycle. 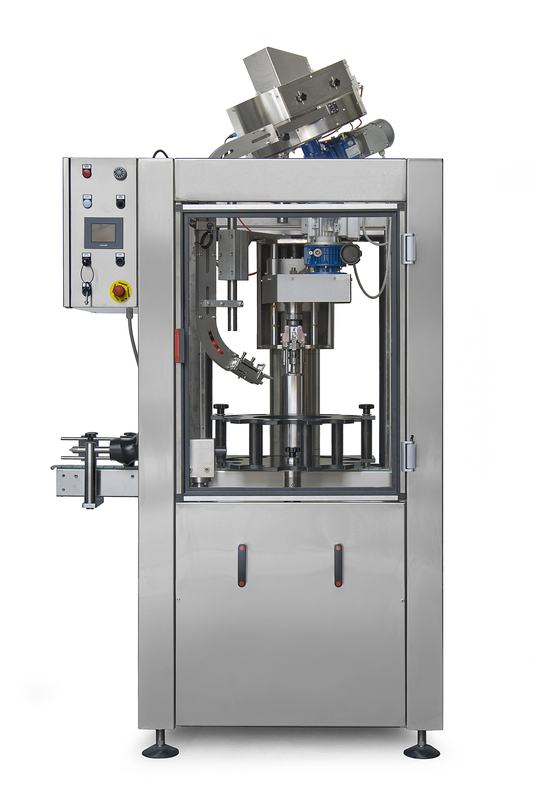 Star Capping Machine with a turret and caps orientation and pick & place for threaded PE caps, pressure caps, squeeze. 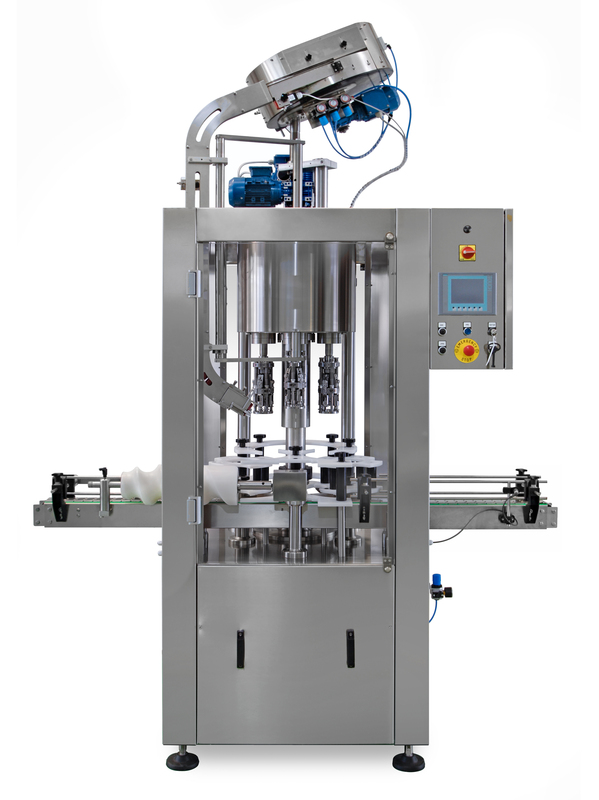 Rotary Capping Machine with continuous operation star. 4 capping heads for twist-off caps suitable for the food industry.